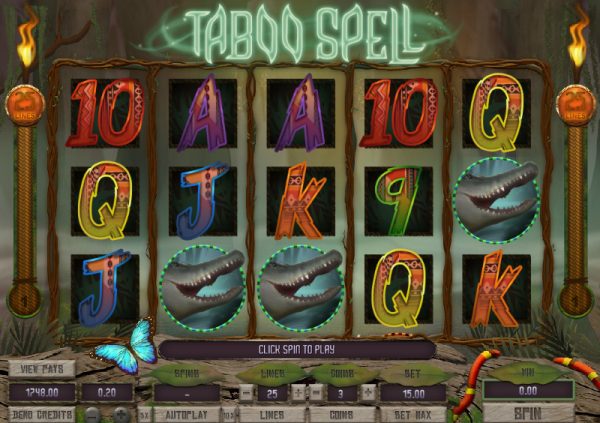 As Halloween draws ever closer it’s an ideal time to check out a new online slot with a creepy theme; Taboo Spell from Microgaming is a voodoo-themed game which takes us deep into the swamps of the American deep south and assails are senses with creepy music and numerous scary symbols. The background to the five reels and twenty five paylines is a misty view into a creepy swamp; two lit torches stand guard on either side of the reels and a blue butterfly provides the only cheerful colour on view. There are some swamp and voodoo-related symbols and these include a decorated skull, a crocodile, a Tiki mask and the witch doctor. Jagged playing card symbols make up the lower values and there are two bonus symbols – the voodoo doll which is wild and the Taboo Spell logo which is the scatter. Free spins are the order of the day here and this is a randomly-triggered feature which can strike following the any spin of the reels. The first thing you will notice is the witch doctor floating in from the side of the reels and casting a spell on the proceedings; that all indicates that some free spin are on the way and you’ll get six for your troubles. The extra bit in this round is that the Tiki mask, the crocodile and the skull are all changed into the witch doctors which makes it a lot easier to land winning combos featuring that character. It’s also possible to get another random reward of more free spins during this round. Keep the sound on and turn the lights off to get the full effect of the creepy atmosphere; as far as strategy goes we don’t have much to offer – free spins is what you want but that’s randomly awarded so just play at maximum paylines and have fun. This is actually a pretty basic slot enlivened by a creepy atmosphere; it’s good fun though if you’d like something appropriate to play on Halloween.